In the northern hemisphere, summer is just around the corner and U.S. National Travel & Tourism Week, recognized every year in May, officially marks the start of the biggest travel season of the year in the United States. Here are a few quick tips from us to make planning, traveling and sharing your summer adventures a bit easier. Begin your trip by finding, comparing and booking domestic or international flights from the U.S with Flight Search. Search for airports or cities, e.g., [flights to JFK] or [flights to New York City], at google.com and flight results will immediately appear below. Select the time and price that work best for you or click "more results" to further filter your search. You can use our Hotel Finder experiment to find your perfect hotel based on price, time, proximity to landmarks and user images and reviews. As you glance over specific hotels, add the ones you might be interested in to your own personal shortlist. Click the red “Book” button to go ahead and make the reservation. 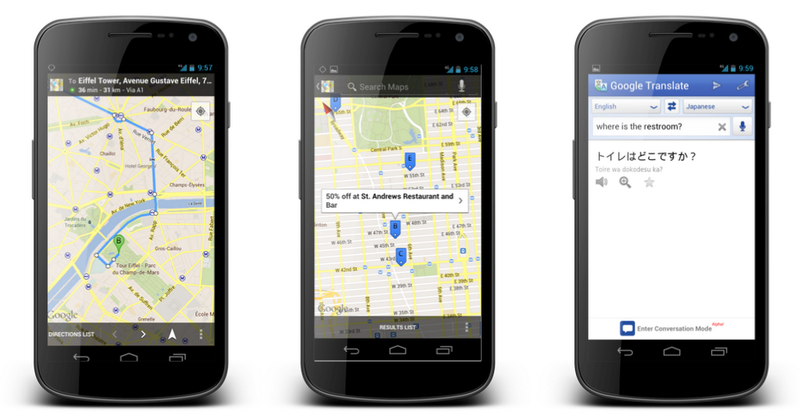 If you’re in need of a local guide, Google Maps for Android can help. Find driving, transit, walking and biking directions, voice-guided navigation and nearby places to eat, shop and play. We just added a few more improvements to the app, including walking directions for indoor maps (U.S. and Japan) and Google Offers near you (U.S. only) so you can discover great deals on the go. Street View technology is also taking you indoors on your mobile—view interiors of participating businesses and museums so you know what to expect before your visit. And of course, you can always use the Street View feature in Google Maps to preview vacations spots around the world, from public landmarks and gardens to amusement parks, zoos and other popular attractions that have partnered with us to get their locations online. If you’re traveling to a region where you don’t speak the language, use the Google Translate app to bargain with a local vendor or tell a taxi driver where you need to go. You’ve also got Google Goggles at your disposal—one click and you’ll know exactly what you are ordering on a menu. Get it for both your Android and iOS devices. Your photos from your phone get uploaded instantly to Google+, ready to share. The Instant Upload feature, part of the Google+ app on Android and iOS, ensures that any photo snapped along the way will be instantly saved to the cloud for safekeeping in a private album, no matter what happens to your phone. Once uploaded it's easy to go into your Google+ photos via the mobile app or your computer, view photos “From Phone” and then easily choose to share to the circles you want. In the case above, I took some sunrise pictures, sorted them on my computer when I got back from my trip and then shared them with my family (if you’re wondering how I shot that panorama above, here’s a tip—if you have the latest Android operating system you can take beautiful panorama pictures by clicking panoramic mode). For a live, firsthand look at how you can use Google to plan your summer vacation, join us for a Hangout on Air at 10:30am PT tomorrow, Thursday, May 10, on the Google+ page. We'll have some in-house experts on hand to show you how to use Google to take your dream vacation. Of course, we don’t want to make it too easy on you. Part of the joy of traveling is being adventurous and encountering the unexpected. We hope these tools help make your travels more informed and enjoyable, without losing the thrill of spontaneity or that hidden gem you may find when you take a wrong turn. Bon voyage!